I was anticipating an horrendous return to work, but it really wasn’t that bad. My morning was taken up with my antenatal clinic, 10 women, all of whom were 28 weeks, or more, pregnant. There were the usual irritations, no room left to write anything in the notes following a visit to the hospital clinic where the a) thoughtless or b) ignorant staff had not had the intelligence to add a continuation sheet, readily available on their desks in the hospital, non-existant in a G.P’s surgery. The woman who arrives late for her appointment and then goes to the loo to produce a urine specimen. The amazement from them that their hospital labels should be kept with their notes, not on the dining table at home (I have no idea what they plan to use these labels for). The woman who requests ‘one of those forms for my husband to claim paternity leave’. What forms, I’ve never heard of them, let alone have one in my possession. I phone up the ‘Job-centre’ who helpfully inform me that there is a form, SC3 , which can be downloaded from the HM Customs and Revenue website. I turn to the woman and relay the info. This is not enough, I must download the form. Prepare for a rant………….I’m sorry, I have certain responsibilities but there are just a few tasks I expect these soon-to-be responsible for another human-being adults to perform and one of them is to sort out their husbands/partners lives. Whilst I’m ranting, Fitness to Fly letters. One of my ladies arrived with one of these letters which her G.P had provided for her, at a cost of £15, and I ended up having to add all the relevant details to it as they had been omitted. I don’t charge anything for these short communications, and if I did, or could, I would not have the gaul to ask £15 but I would ensure that it was fit for purpose. Next to last woman, now 34 weeks pregnant, 3rd baby, poor obstetric history, even worse psychiatric history, burst into tears as she walked through the door. We sat down, had chat, I glanced at her notes and saw that she had been seen by the obstetricians yesterday. ‘Hey L, you saw the Docs yesterday, is there a problem?’ Floodgates opened. L doesn’t trust the Doc. He hadn’t read her notes, didn’t know what had happened before. Didn’t use a tape measure to measure her bump, just walked his fingers up it counting. Didn’t listen to baby’s heartbeat, ‘I felt it move. That’s good enough for me.’ He then advised L that she should remind the staff in theatre that after her previous caesarian she had developed an incisional hernia as they ‘might not read her notes’. I tried to read what he had written, illegible. He had signed it, but that consisted of a curved line. No identifying his name, grade, nothing. Thanks to this anonymous numbskull I then spent 50 minutes reassuring L that she would be quite safe during her stay in hospital. One quick glance at her notes should have alerted him to the fact that here was a woman who required extra thought to be put into how anything was communicated to her, instead he behaved with a total lack of insight and was obviously refering to himself when he mentioned doctors not reading notes. This afternoon one of my visit was to a Mum who is an insulin dependant diabetic. This is her 3rd baby born by caesarian section, and her third baby to have been born by an emergency CS due to fetal distress. With all her babies it was her vigilance that ensured a happy result as she had noticed reduced fetal movements and taken herself into the hospital, where monitoring had revealed that baby was no longer happy coping with her diabetes. With this pregnancy the caesarian was scheduled for 38 weeks but at 37 weeks, once again, baby’s movements slowed right down. In she went and 2 hours later a baby boy weighing 9lb 12ozs was born (heaven only knows what he would have weighed if she had reached 40 weeks), large babies are a feature of mothers with diabetes. This time though baby has another problem associated with maternal diabetes, cardiomegaly (enlarged heart) combined ith polycythemia (too many red blood cells). The condition was only discovered when they conducted a scan due to him experencing minor breathing difficulties, they will be going to a cardiac unit on Thursday to have a detailed assessment. Baby is now 14 days old, he did appear extremely pink, verging on red, but was feeding well and was breathing normally, I really hope that he is going to be well but I have to say that I have a ‘feeling’ about him. I hope I’m wrong. So my first day back, full of listening and reassuring mixed with a smattering of midwifery, or is that what midwifery really is? Today is Isabel’s 1st birthday. This time last year we were all on tenterhooks, after several false alarms early on, bleeding, prem labour and then an ECV my 3rd grandchild was born at home. Yesterday we had the family birthday party, there was a huge amount of food, an awful lot of it coloured a vivid pink. Izzy took her first steps last Thursday and took pleasure in showing everyone how, if you move one foot, then the other, you will fall over very quickly! She is fascinated by the twins, double the opportunities for sticking fingers in eyes and bashing heads. After repeated admonishments about using them as her personal punch-bags she crawled off, grabbed a (pink) balloon and was overjoyed to discover that she was allowed to bang them around the head with a large object and all anyone, including the twins, did was laugh. It’s odd to remember that when Izzy was born we did not know that there would be yet another grandchild that year, let alone two. This morning I baby-sat for the boys whilst daughter and Amy went to the dentist, and I really don’t envy my daughter, or anyone else, who has twins, it is absolutely non-stop. One is happy and content to lie on his playmat, the other one is bored, wants entertaining or some milk. You get No.2 settled and previously happy little man starts demanding attention. I have found a good diversionary tactic, take their nappies off and let them have a kick around. That was working well, then Louis decided to show off his rolling skills, at the same time as having a sneaky wee, so Nanny didn’t know what was happening until he rolled onto his back again and the fountain became obvious, liberally showering him, Jamie and the carpet. What will it be like when they’re crawling? Back to work tomorrow. I’m anticipating that my tray will be absolutely full of yet more directives from ‘on high’, audits that need undertaking and communications requesting a breakdown of stats. Completed my end of year stats before my holiday so at least that nightmare is over, hopefully. What I really am interested to know is why, if we have to complete monthly stats and send them to some poor data entry person via our manager, we then have to complete end of year statistics of exactly the same information. Have they not heard of Excel spreadsheets and the amazing ‘wizards’ that would, at the click of a button, produce all the figures they want in an assortment of formats? I really don’t don’t know why I question all the duplicating of information and tasks, it is the NHS after all. 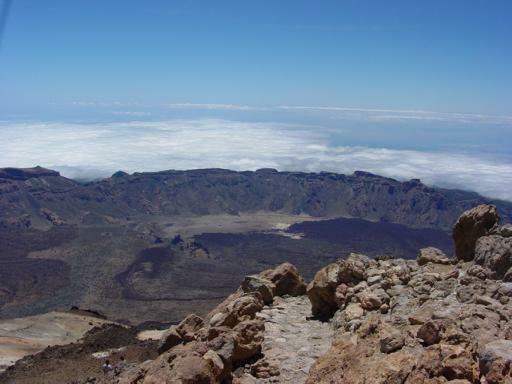 This is the highest point in Spain and the world’s third largest volcano, and we went up there! Yes, this is something that 1,000’s of tourists do every year but I bet not that many are as afraid of heights as I am. Apparently the ride up there was magnificent, I wouldn’t know as I had to shut my eyes for large parts of the journey but on the occassions I did open my eyes I was impressed by the sheer magnitude of the geological repercussions of previous eruptions. When we reached the caldera I was gob-smacked, it’s huge, far, far larger than I had ever envisaged one to be and a true reminder of how insignificant we are and how powerful nature is. Being a true pleb I texted Amy and Jack to let them know that Nanny and Granddad were standing in a volcano. This was not a scare tactic but something that I knew they would be hugely excited about as they both (thanks to Nanny) got a fascination with volcano’s and I have promised them that when they are older we will go and see an active one. I am actually re-thinking this promise as I had not included in my plan the necessity of achieving a great height! I shall have to start investigating where I can find a ground level, magma producing, fire-spitting volcano. I now want to become a vulcanologist, or a geologist. This always happens when we go rambling on our holidays, I find something I want to know more about. Lyme Regis, yes, I’m going to be an paleontologist; Menorca , I’m the next Indiana Jones (I am still totally entranced by the amazing sites on this island), heaven only knows what made me settle on midwifery as a career. Anyway. Tenerife. Friendly, warm, relaxing and a visit to Mt Teide well worth the effort. Car hire, at this time of year, reasonable, 60 euros for 3 days. Petrol, cheap, about 65p a litre. A meal out for two, one with an extremely healthy appetite, at a good restaurant, complete with non-frugal supply of drinks, 35 euros. Would we go back? Definitely, but only at this time of year as it is all too easy to imagine what it may be like in the high-season. I don’t know about this. The sceptic in me is saying ‘Bah. Humbug.’ Daughter used it for Jack when he had colic. That’s a lot of stuff and nonsense as well. Colic. If there really is such a complaint, then 90% of the babes I know of have it. Infacol make a fortune out of babies being babies and having an unsettled time, generally in the evening. Mind you, the devil’s advocate in me has heard that colic is unknown in cultures where infants are carried around in slings/papooses, rather than put down to sleep flat on their backs with a full tummy. Oh yes, back to the cranial osteopathy, which Daughter now dismisses as codswallop, I heard a story today which had me giggling, and wishing I could discover a ‘therapy’ which tired parents would be willing to pay me dollops of money for in the hope that it will make their new addition a happy little bunny. Background – Baby in breech position, elective caesarian section at 40 weeks. Weighed just under 7lbs at birth, well baby but had really pronouced slope to it’s skull which is a manifestation of a persistant breech presentation. Baby was very slow to regain it’s birth weight, it fed well if it’s Mother would feed on demand but she was into the gestapo, clock-watching persuasion so food was not freely available. Anyway, she started the cranial osteopathy because of the abnormal skull shape, I can understand, empathise with this, but then things go slightly ‘kooky’ to my mind. Off Mum and baby go to for their routine osteopathy session, baby has the sniffles. Hands are laid on, the nasal bone is tweaked and the runny nose has gone, immediately. Wonderful. Personally, I’m amazed that this instant, complete cure for the common cold has not it the headlines, but there you go, genius is often misconstrued. The tale goes on though. Baby had been sleeping through the night prior to the miraculous healing but once the acute coryza (cold) had gone baby started waking in the night. Back went Mum to the osteopath and explained the problem. Apologies abounded. Apparently, when the nose was being manipulated she had stimulated the gums and now baby’s teeth had been roused into action and are moving around in the gums, nothing to see……….it can’t be reversed. Time is the healer. Now, what do you think? I am having a hard time taking this seriously. No more twaddle for a week. A bit of R & R is going to be happening. Yesterday I went for my pre-op assessment where I “would have the opportunity to ask questions about my operation”. No I didn’t, because the lovely nurse who runs the unit is a general pre-op form-filler, BMI calculator, leaflet giver and is not knowlegable about every operation. I had (stupidly) imagined that I would be seeing, being assessed by, a person employed within the speciality associated with my op. Obviously I can’t expect anyone, Doctor or Nurse, to be cognisant of every procedure available within the operating theatre so I couldn’t be upset with her, just disappointed and back to relying on the internet. It was interesting though as I had an ECG. I’ve never had one before so it was reassuring to have my heart activity checked and declared perfect. I also had blood tests, tremble, tremble, I verge on needle phobia so it takes much girding of loins to sit and wait to be summoned to have a needle stuck in a vulnerable part of my arm. I was overjoyed to only have one person before me, less time for adrenaline to course through my body and instigate my ‘fight or flight’ response. I was called in, and as is usual I warned the phlebotomist that I am nervous about having blood taken, to the extent that I have been known to faint. I have met more reassuring ‘vampires’ but I calmed myself, safe in the knowledge that she does this all day, every day. Unfortunately she had a cough, a very tickily persistent cough, whilst the needle was in my vein. Jiggle, wiggle went the needle, breathe deeply said my brain. I remained calm. When I got home I took my coat off, I thought I had a cream jumper on but the arm was red. I had bled, quite a lot. I also had a large, swollen, blood filled haematoma. Today I have an impressive bruise, the size of a saucer, that’s going to look attractive when I’m on holiday, wearing T-shirts. We go on Friday. Tonight we have Jack and Izzy whilst their Mummy is at O2 watching the Spice Girls. Hubby is horrified, “I thought we had brought her up properly. How can she be going to see the Spice Girls?” It will be interesting to hear what she thinks of their performance, and O2. When it was in it’s previous incarnation, as the Millennium Dome, we went there and were all disappointed, hopefully it is now an improved facility. Amy’s and the Boy’s Mummy is consumed with her current project, finding daycare for when she returns to work. She reported this morning that it, and the twins, are giving her sleepless nights. What she requires is 3 days for Amy, and 1 day for Jamie and Louis, I’m having the Boys for the other 2. Her findings so far are not good, some of the care providers do not inspire her with a desire to entrust her babies to them, and so far the have all worked out too expensive, they average out at £875 per month, including the government early years education allowance for Amy, this would leave daughter with under £.250 for the month. Hardly worth the effort really, especially once you take off petrol costs etc. but they need her to work. A solution would be for her to find an evening or weekend job, then they wouldn’t require childcare, but she has been with her company for 10 years and put in a lot of effort to achieve her current role, it would be such a waste. More bad news on the staffing front at work, my job-share is going into hospital to have her gall-bladder removed, she will be off at the same time as me, woe, woe and thrice woe. I really can’t see how the community service in our area will function. I am feeling quite guilty and have been musing about whether I should postpone my op, after all I haven’t got a life-threatening condition, just life affecting. I have debated it with Hubby and a couple of friends but they all pointed out that I have already waited a few years to submit myself to the surgeon’s knife, mainly because I am such a wimp, and they are suspicious that I am just using work as an escape route. They may be right, it’s difficult to be objective really, wood, trees etc., I could justify anything. Nanny announces that she is going to the loo. As is usual Jack and Amy decide that they both need to go as well. Jack is using the toilet, Amy is sitting on the potty, Nanny is overseeing proceedings. Nanny Make sure your willy is pointing down Jack. Nanny Yes, and all boys and Daddys have got willys. Girls havn’t got one though. Amy No. We’ve got bits. Nanny Yes. That’s right. Let’s wash our hands now!